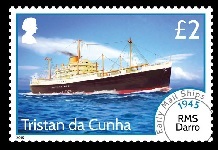 This definitive stamp issue depicts the main ships that carried mail to and from the island between 1904 and 1953. 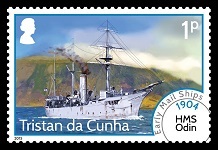 Tristan da Cunha is the most remote inhabited island in the world lying some 2,430km from St. Helena and over 2,800km from Africa. The island was discovered in 1506 by the Portuguese navigator Tristão da Cunha. In 1816 the garrison was occupied by British Marines and when disbanded Corporal William Glass chose to stay on the island. He can be regarded as the founder of the present community. Mail from and to the island became very important as it was their only opportunity to communicate with the outside world. Quite often this could take years as they were dependant on passing ships, like whalers, to carry the mail. 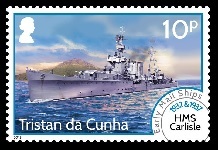 Eventually after numerous requests British war ships called annually but even this waned. 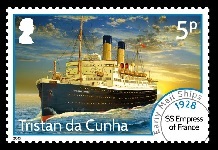 This definitive stamp issue depicts ships that carried mail to and from the island between 1904 and 1953. Of course most of the ships calling at Tristan would carry out this task and as such not all of the ships from this period are included. Called at Tristan 23 January 1904. This was the last of the war ship visits for the next 15 years. Weighing 1,070 tons she was built in 1901 at the Sheerness Dock yard as part of the Cadmus Class. She was a 10-gun screw steel sloop built by the Royal Navy and undertook Survey work. At the time, some of the islanders wished to leave Tristan. A proposal came from HMS Odin that they could be evacuated but there was a proviso that the terms would only hold good if the whole population migrated. Out of 17 families 7 voted to leave and 10 to remain, so the offer was withdrawn. 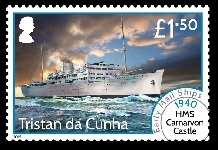 Called at Tristan 15 February 1927 and was the first ship to call for over a year. Supplies and mail were brought ashore using a water tight raft towed to the shore. Mail was taken off and reached London 14 March 1927. The second Royal Mail Line ship of that name, she was built by Harland & Wolff, Belfast in 1925. In 1939 her forward funnel was removed and she was taken over as an armed merchant cruiser until torpedoed in the South Atlantic in 1943. After repairs she went on to carry more than 30,000 people to Australia. In 1957, whilst being scrapped, she was loaned to the Rank Organisation for the use in the Titanic film "A Night to Remember" starring Kenneth Moore. Her port side was used to depict Titanic in the life-boat lowering scenes of the film even as the shipbreakers were at work on the starboard side. Called at Tristan 28 February 1928 and was the first ship to visit for 11 months. 54 letters and 3 packages were landed. The ship was on its way from Buenos Aires to Cape Town. It landed stores and gifts from USA, Canada and Great Britain. 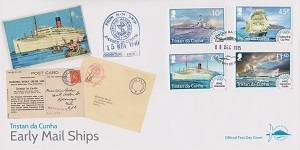 19 tons of stores arrived, sent by the Tristan da Cunha fund, and 8 mail bags were landed. The stores were dispatched by 3 of the ship's boats but then transferred onto island boats which were better suited for landing in the surf. 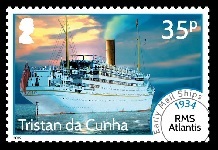 Initially launched as the SS Alsatian she was re-named in 1919. Visited Tristan in 1932 and 1937. She landed 7 January 1932 with the New Bishop of St Helena, the first such visit since 1856, and the Tristan Representative Mr Percy Snell. The opportunity was taken to try and establish whether a radio transmitter could be installed to assist future possible sea plane visits. Photographic Postcards were produced for the visit showing pictures taken between 1922 and 1929 which proved popular with the crew and now collectors. On her second visit she landed 28 February 1937 carrying 74lbs of letters and 1600lbs of parcels, amongst them 500 special illustrated envelopes produced and sold on board by the mail officer. This visit included a dental survey which was reported in the 1938 National Geographic magazine. Visited Tristan around June or July 1934 and the mail she took was off loaded at Singapore bearing the date 24 September 1934. Built in 1903 in Italy as Regina Elena she was sold to Germany and renamed Ponape in 1911. In 1914 she was arrested by HMS Majestic, escorted into Falmouth, declared a war prize and renamed Bellhouse. In 1925 she was sold to a Finnish company and re-named Ponape. Visited Tristan 19 February 1934, landing 12 tons of provisions including mail. 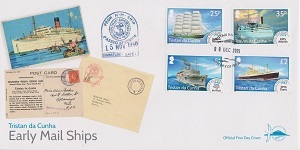 Some of the mail was struck with an oval ship cachet which has become highly collectable. 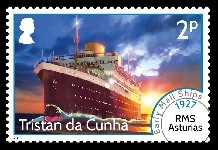 Previously a liner named Andes, the Atlantis was converted into a cruise ship and renamed by the Royal Mail Steam Packet Company in 1929. 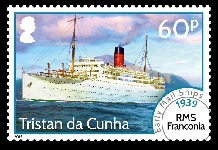 She later served as a hospital ship during WW2 and ended her career transporting British emigrants to Australia and New Zealand before being scrapped in 1952. Called at Tristan 31 January 1937. This was a refurbished barquetine. 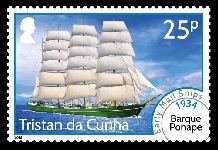 She carried mail to the island on its world cruise and was allowed to fly the Royal Mail Pennant by special permission, the last sailing ship to do so. It unloaded 9 bags of letters and 10 bags of parcels. Visited Tristan 21 February 1939 on a cruise from New York. 4000 souvenir postcards were produced on board and sold to passengers, an image of this postcard is featured on the First Day Cover envelope. 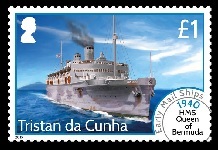 Mail was dropped off and taken on board, but no passengers could land on the island as a case of chickenpox had broken out on the ship. She was requisitioned as a troopship in 1939 and in 1945 was used as a headquarters ship for Winston Churchill and the British delegation at the Yalta Conference. At the end of the war in Europe, Franconia made several trips across the Atlantic carrying returning US troops and refugees. After VJ Day she was employed repatriating British troops, including freed Prisoners of War, from India. During her government service, she had covered 319,784 miles and carried 189,239 military personnel. Called at Tristan 24 August 1940. Built in 1933 by Vickers Armstrong Barrow she has been referred to as one of the most beautiful cruise ships of all time. She was converted to an armed Merchant Cruiser, her assignment being South Atlantic patrol to intercept German raiders and to destroy Antarctic shore installations that may be set up. War Time mail was censored and a tombstone type cachet dated "Aug 24 1940" appeared on this mail with the unknown censors' initials of RAS or LAS (see FDC). Visited Tristan 15 November 1940. As with HMS Queen of Bermuda, mail from this wartime visit was censored and bore a tombstone cachet dated "15 NOV 1940" (see FDC). She was the first Union Castle Mail Ship to exceed 20,000 tonnes and after a re-fit in 1937-8 she set a new record for the passage to the Cape (12 days, 123 hours and 38 minutes) which stood until 1954. At the outbreak of WW2 she was converted to an armed merchant cruiser and shortly afterwards had a 5 hour battle with the German Auxiliary Cruiser Thor. In Montevideo she was reportedly repaired with steel plate salvaged from the Graf Spee. Called at Tristan 11 October 1945. Built at the shipyard Harland & Wolff, Belfast for the Royal Mail Line she was launched on 7 July 1935. A refrigerated general cargo ship, registered to the Royal Mail Meat Transport Ltd (a subsidiary of the Royal Mail Steam Packet Co.) she was later converted to a troop carrier and believed to be the first vessel to call at Tristan after WW2. Called at Tristan on numerous occasions between 1948 and 1953. 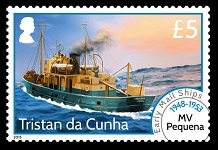 MV Pequena was a wooden-hulled minesweeper converted for crawfishing, built in Nova Scotia and 184 gross tons, she was a surprisingly small ship for the long trip between Cape Town and Tristan da Cunha. In 1948 the crawfish industry sponsored by the wartime padre Reverend Lawrence was becoming established, and this vessel was used for the survey and later for handling the catches and transport to South Africa. 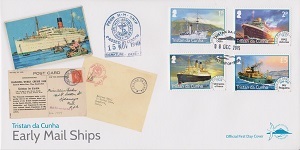 Mail in and off the island were transported by it, and during the survey illustrated envelopes were produced which are now highly collectable. 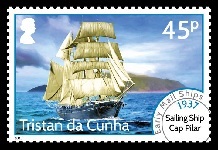 Mail today can be found from most of its sailings. We acknowledge with thanks the help and assistance of Robin Taylor and Ray Lloyd. Technical Specifications from Pobjoy Mint Ltd.